This soup is a wonderful, fragrant, slightly sweet, slightly spicy and completely delicious. It’s a perfect warming soup for the last cold days of winter. This is always a big heat for a group, and except for dicing tons of sweet potatoes, it’s easy to scale up or down, and is definitely a crowd pleaser. In a pot, melt butter and saute shallot and sweet potato until shallot is tender, about 2 minutes. Sprinkle with curry powder, then stir in flour. Gradually stir in the milk. Bring to a simmer over medium heat (don’t let it heat too quickly or the bottom will burn) for about 20 minutes, or until potatoes are tender. About 15 minutes before serving, stir in the half and half and the peas, let soup heat through. 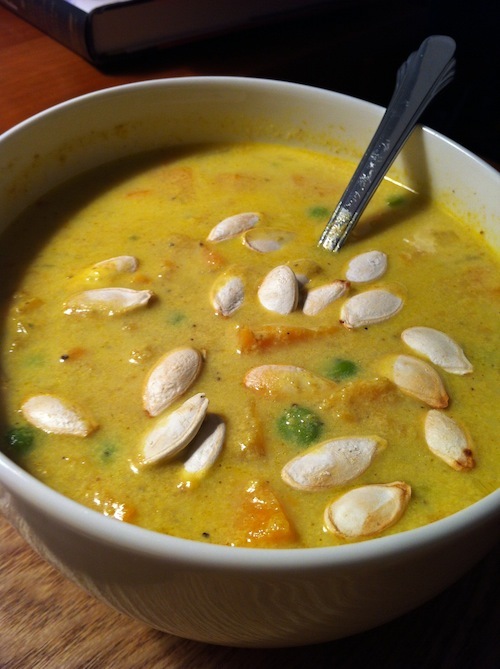 Serve with pumpkin seeds. Follow directions above, although everything with obviously take longer with the large pot.